We are the only hostel in St. Augustine. Our multilingual staff speak French, German, Arabic, Spanish, Dutch, American English, Australian English, Kiwi English and even English English. Our hostel is located downtown in the historic district in a building dating from 1915 complete with wood floors and high ceilings. Please note our Dorm is CO-ED only (male and female). We have a rooftop patio/smoking area, common kitchen with all appliances, common room with DVD, Satellite and Roku, free high speed internet on our Chromebox or free all you want encrypted wi-fi. Our central location means that food and nightlife abound within a short walking distance from the hostel, as well as numerous shops and galleries. We are 1 hour away from Daytona, so if you want to see an event in Daytona (Bike Week, Daytona 500, etc.) but don't want to pay for an overpriced motel there, come stay with us, and we're two hours from the Kennedy Space Centre. St. Augustine is America's oldest continuously inhabited city. The impressive Castillo de San Marcos has never been taken in war, though the British laid siege to it in 1702 and 1743. The area is brimming with history that comes alive during the recurring re-enactments of pirate raids and both British and Spanish night watches, and the black powder cannon firings at the fort on weekends. The Colonial Spanish Quarter is a must see for interested students of history. The living historians there re-enact the daily life of St. Augustine in the year 1740, and Friday and Saturday evenings the sound of sea chanteys (Blow the Man Down, etc.) pervades the authentic period tavern where the lovely barmaid Gilley serves up ales and ciders. The beach is 4 miles away, an easy bike ride, and features the undeveloped shores of Anastasia State Park. Rarely does anyone walk or bike the whole distance to the inlet so chances are that you can find a stretch of beach for your very own. Our friendly staff will give you a map and tell you about the things worth seeing and perhaps more importantly about the things NOT worth seeing!. If you see no availability on the date you want, please call to make sure. Please Note: Our normal office hours are 9-10 PM. If you arrive outside of those hours, please give us a call and we will give you the door code, or visit our web-site. No local residents except Students with current ID! Must have valid driver's license (State Issued 'ID only' not acceptable). Taxes not included in rates shown. No one under 18 years of age in the Dorms. Great location with a chill atmosphere. It smelt very clean, and towels and bed sheets were provided! Something interesting to note is that the dorm room had 3 bunk beds and a big king size bed in the middle... I've never seen this set up before, but it didn't really bother anyone even if two people were sharing the big bed. Also the free morning pancakes were wonderful, and the friendly staff and hostel residents were great to talk to in the cute little communal kitchen. I truly enjoyed my stay. It was a bit pricey for a dorm hostel I feel, but still way cheaper and more fun than a typical hotel. The location was fantastic- walking distance to everything. This hostel is fantastic. Staff are really friendly, the place is quiet but makes for a relaxed, chilled vibe. Spend a night in on the rooftop patio or watch a movie on Netflix they have there. Rooms and bathrooms are clean. Pancakes for breakfast are nice and location is great right in the heart of St Augustine and is a short walk to all the attractions. This was perfect location for everything you would want to do. Conrad is a fantastic guy that runs the place and can cook a mighty pancake. A really nice relaxed hostel and you meet some very nice people from all ages and all around the world. A great stay. Great location but quite cluttered. Don't have many hostels in the states to compare it to but is not nearly as nice as many hostels abroad. Beds were comfortable and pancakes are included. I would stay here again as it is the only affordable accomodations in the area. The place could use a facelift, but you can’t beat the price for the location!! 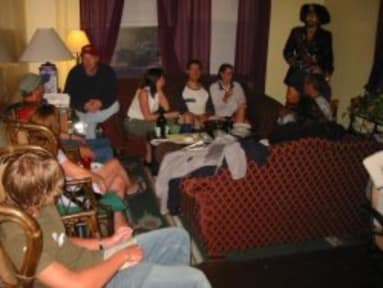 I am a solo traveler and Pirate Haus Hostel does not cater to individuals on weekends. This can create difficulties with travel plans. A charging station for electronics would be helpful.